Thanks Wachuko for clearing that up for me! I got a quote for CR70 on the windshield and CR 40 on the door windows for $800! From everyones posts, it looks like the sweet spot is in the $600 - $695 range. I paid 600 even cash for 90 on windshield and 70 on doors in south carolina. I asked for cash discount. They did great job and the results in the sun are dramatic. Personally, if I did CRYSTALLINE on windshield, I would also do CR70. I think it looks great & I would not have problem driving even at night. BUT I am pretty sure that is way below legal in any state VLT 69%. Some states don't even allow anything below VLT 90%. Since I did LLUMAR AIR, I had 2 choices AIR90 VLT 84% or darker AIR80 VLT 77%. My shop, the largest LLUMAR dealer in Las Vegas said legal on windshield is AIR90 but because of the slightly understanding & accomodating local law enforcement, we are able to get away with AIR80 (they did ask to see registration is in NV).. I guess VLT 77% is rounded off to 80%. Anything lower, I would be required to bring a doctor's prescription or note. Just be sure to check what your local codes are and more important, what local law enforcement tendencies are. The CRYSTALLINE dealer I went to in town (who I would have used if they had a facility to fit the tall AI) echoed same doctor's note requirement if I wanted CR70 on windshield. There is a HUGE difference in heat transfer between AIR80 & AIR90. So I would imagine the same for CR70 & CR90. In Ohio it’s 50 percent visible light transmission (VLT) on the two front windows and 70 percent on the windshield. According to the 3M chart that Interblog posted, I can use CR70 on the windshield but can not use CR40 on the front doors because it’s only 39% VLT! To be legal, I’ll have to use CR50 on the front door window. (7) reaching a non-responsive phone line yet again. 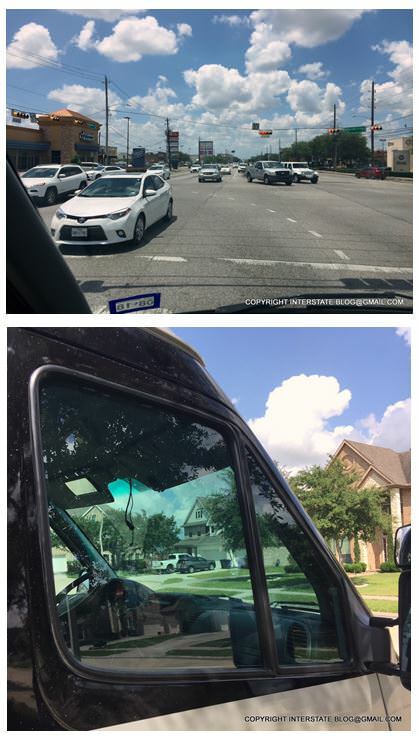 (9) I found a guy on Hillcroft with whom I scheduled for Friday morning. The Houstonians known as Tayara are going to chortle and think, "Gee, she likes to live dangerously." This is exactly the kind of outfit that the non-3M-ing Galveston County installers cursed and warned me carried a high probability of rip-off. So if all goes according to plan, I'm going to put the logo validation method to the test. I will see the exact film before it goes on our rig, and I will see the logo on the installed product before I pay the bill. And I'll tell the installer these requirements in advance so that we are clear on how this job is going to go down. It's a win-win situation for me. Even if the 3M foray turns out to be a bust, I'll get some great Tamil food for lunch. There's none better in these entire United States than there is on Houston's Hillcroft Avenue. ---Bangs head on desk yet again---. I may get to use a few of my new space blankets during the job. This tint guy doesn't have a canopy or a bay large enough for the Sprinter (neither did this week's tire sellers, and neither did the windshield seller). I may string a few space blankets between his existing canopy frame and my roof. It's better that the windshield be sheltered a bit during this job, I think. Ah, I’m finally starting to understand the enormous cost discrepancy on CR tint job bids. This never occurred to me, but If the ENTIRE Sprinter windshield is done in CR, then 2x the typical CR is needed because cutting the top filler strip destroys another full length of the tint. If that top strip is instead done in another 3M product, it’s much cheaper. Hundreds cheaper. Here is what the CR-70 looks like in person. It is done, our CR-70 job. Let me explain and clarify what I said above. Like a couple of dumb patooties, the store manager and I began this transaction by debating what material to use for the top strip. Well, shoot -- we came to realize that the T1N Sprinter *doesn't need* a top strip. This outfit had tinted Sprinters before, but not T1Ns. Our windshields are about 34 inches deep and the product is 36 inches -- so we can just barely squeeze a windshield out of a single strip (remember the curve has to be accounted for and the sheet has to be pre-shrunk to the curve, so the static depth of the windshield is not the controlling factor). Apparently the NCV3s need closer to 40 inches total, and so a single sheet application cannot happen. Moral of that part of the story: If you've got a T1N and you want 3M Crystalline, make sure you specify that you have the smaller Sprinter when you're getting a quote. Otherwise they'll assume you're a 2-sheet windshield instead of a 1-sheet windshield. And by the time you're done with this whole process, you might want to be 3 sheets to the wind (I thought I'd make the obvious humorous association before someone else did). Obviously, thus far all I did was drive home, so I have not tested this job under a range of conditions, but on initial analysis, I'm very pleased. The CR-70 is definitely not too dark. I still must wear my sunglasses. Here's a pic through the windshield, fairly true to life. On the lower pic, remember with that view you're looking through two layers of tinted glass, side and front, not one layer. So the tint is only half as dark as what you see there. It's not heavy at all. Here's a pic through the windshield, fairly true to life. On the lower pic, remember with that view you're looking through two layers of tinted glass, side and front, not one layer. So the tint is only half as dark as what you see there. It's not heavy at all. I did the CRYSTALLINE a couple of weeks ago. I had intended to do the 90 on the windshield and 70 on the side windows. Wound up doing the 70 all around and I believe that was the right choice. Had to drive down to Chicago area to find a qualified installer. Cost was $550. I also had them put the clear chip protection on the front. That was pricier -- $1300. I am planning on driving the AL-CAN highway next summer and thought that it may give me a bit more protection. I did not do above the windshield nor the front wheel wells. Ran out of time and it was already pretty pricey. Shop did a great job and had a high bay so no problem getting it in and out. One note, they only had the 36" wide roll thus a small part wasn't going to be covered. I opted to go all the way down to the bottom and leave a little gap on the outside top portion of the window. That portion is within the tinted eyebrow and doesn't affect my line of sight. I suspect that the 36 inch limitation is a result of the technology. It’s so hard and so expensive to manufacture the stuff that the cost-benefit analysis just didn’t work for a larger production line. That would be my bet. It’s especially unfortunate given that the only option is to consume 2x if a customer wants the same product on the eyebrow. Initially before we discovered we didn’t need this, my husband asked if they could turn the sheet 90 degrees and do a vertical seam, which would consume one extra foot instead of five to six ( such a seam would be behind the rear camera monitor and we would not see it anyway). No dice. The material is engineered to shrink only one way. If it’s up-ended, it won’t shrink properly. Not being able to do it with a single sheet for the newer AI, not really an issue... I will try to get photos of mine. The strip on top takes care of it and there is nothing in the line of sight that would bother the passenger or driver. So outside of the cost or wasted material, it all works well. BTW, there are a couple of comments above about the vehicle needing to fit inside a shop in order to do the CR-70. I think I read that indoor application is stipulated by 3M, for cleanliness reasons. Our Interstate's job was done outside. I was able to poke the nose of the van under one of their canopies, but it didn't come close to fitting into any enclosure. Poking the nose did not achieve much. It was an unusually windy day and the wind blew right through the canopy. The skill of the applicator is probably the quality-determining factor. My husband had his daily driver tinted at another location, and his car is a typical econobox - it easily fits inside any garage bay. But his job is worse than the Interstate's job, in that it has more visible application flaws. So, some installer may tell you that they can't do your 3M work because they don't have a bay tall enough for an Interstate, and they may want to stick to that as a policy. But unless there's a sand storm raging outside, I'm not sure that the fear is well-founded.